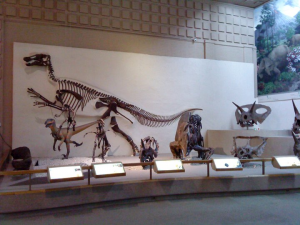 The Great Hall of Dinosaurs at the Peabody Museum features fascinating displays and fossils. Photo courtesy of Daniel Shen. George Jacob, an internationally renowned museum professional, was recently quoted saying that “museums are collective souls of civil societies” in The Times of India. To most of us, that does not mean much; museums are the monolithic, marble monuments containing dinosaurs and moon rocks. We recognize these institutions as the playgrounds of our youth, where we sprinted from one exhibit to the next in a desperate attempt to satiate the wildfires that were our questions, only to fan the inferno that is our curiosity. I never considered just how many people work behind the scenes to make these treasure troves a reality until I spoke with Dr. Derek Briggs, Director of the Yale Peabody Museum of Natural History, regarding his perspective on the museum. I arrived at the Peabody an hour early to browse the exhibits. As I admired The Age of Reptiles in the Great Hall of Dinosaurs, a security guard named Peter Hastings walked over, musing at the famous 110-foot long Zallinger mural as if it were the first time he had seen it. He introduced himself and shared everything he knew about the museum and its staff. I was entranced before even arriving at Briggs’s office in a corner of the building. What kinds of people, then, work in museums to foster such an environment of research and education? Briggs noted that most collections managers have Ph.D.’s and that their primary focus is on issues related to conservation and research. They are the “critical piece in terms of making sure that the collections are around for your grandchildren and mine,” he said. He further elaborated that collections managers are people who are very committed to doing things that have enormous lasting value and oftentimes have personal interest in parts of the museum’s collection. “Because we have collections that are fundamental to the kinds of research that many people do, our curators are Yale faculty who want to be here for the collections. These are scientists at the top of their game that happen to be doing things relevant to whatever the museum is up to.” Such a trend holds true for all science museums, not only ones at universities such as the Peabody. Dr. Cathleen Lewis, a curator at the Smithsonian and a Yale graduate, explained that she had applied to the CIA following her graduation but chose a career as the curator of International Space Programs at the Smithsonian National Air and Space Museum because it was “much more dynamic.” It was an opportunity not only for Lewis to fully pursue her passions, but also to earn her Ph.D.
Briggs made clear that everyone who worked in a museum truly loved it there and that there are many opportunities for students to serve as docents in the exhibitions or research associates in the collections. As Lewis puts it, “Volunteers are the ones who polished the Enola Gay before it went on display. That is always the best start. Getting your name in and finding a niche.” And for whom would Lewis recommend a museum career? “Just about anyone. We have internship opportunities in science, engineering, history, social studies,” and the list goes on and on. So the next time you need a study break or just have a spare moment, consider a visit to the Peabody to rediscover that child-like sensibility that so allows our imaginations to be completely captivated. And by doing so, you may also discover a career in a museum for your future.